ST. GEORGE — With tax season just around the corner, many are wondering how their tax returns will be affected by the implementation of the Tax Cuts and Jobs Act of 2017. 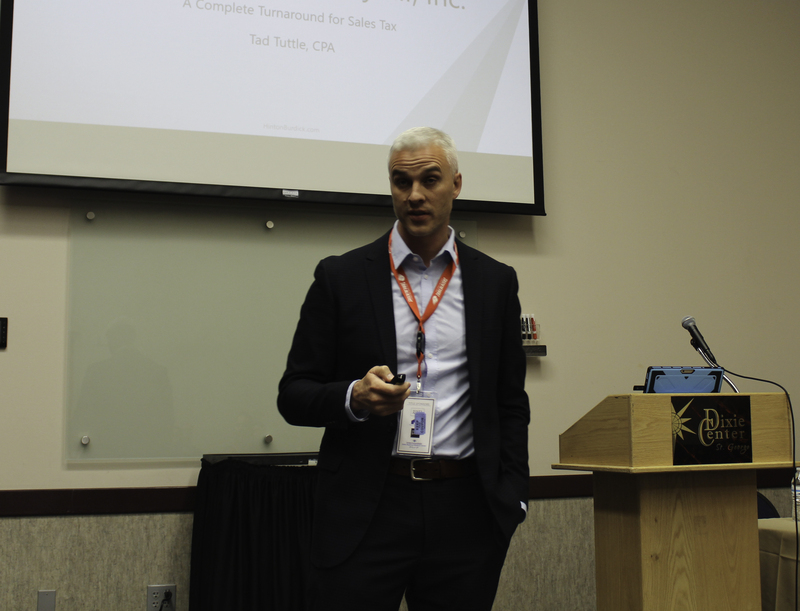 Certified public accountants from Hinton Burdick, a tax firm in Southern Utah, explained tax reform and major changes for businesses and individuals in a “What’s Up With Taxes?” breakout session Thursday at the annual St. George Area Economic Summit. “It is an exciting time in taxes for business owners. It typically doesn’t go together – exciting time and taxes – but they really are,” Phillip Peine said. 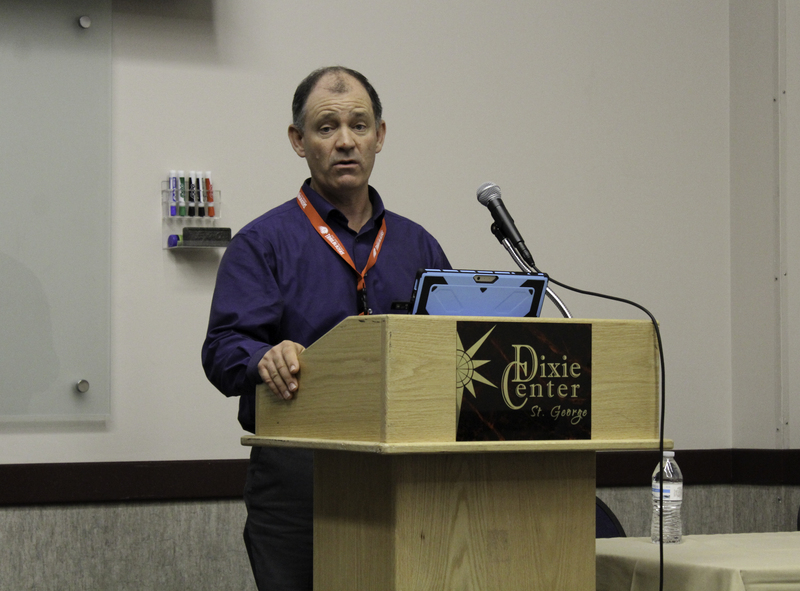 The economic summit is held annually at the Dixie Center St. George and provides economic information for the upcoming year, offering breakout sessions for specific topics, networking and several keynote speakers. The breakout session covered the highlights of Tax Cuts and Jobs Act of 2017 (TCJA), as well as changes in online sales tax and explained the qualified business income deduction, or the 20 percent pass-through deduction. While the number of tax brackets remains the same, most tax rates for individuals were decreased and some may find themselves in a lower tax bracket since income thresholds have been lowered, Chad Lamber said. “The general idea is that overall, pretty much all taxpayers with very few exceptions, are going to see a decrease in the tax rate that apply to their tax forms,” he said. The standard deduction has nearly doubled, going from $6,350 to $12,000 for single and married filing separately, $9,350 to $18,000 for head of household and $12,700 to $24,000 for married filing jointly. The increase in standard deductions will reduce the number of people who choose to file itemized deductions to about 5-10 percent of taxpayers as the standard deduction will likely now be higher. Additionally, the TCJA suspends all miscellaneous itemized deductions subject to the 2 percent of adjusted gross income floor and affects unreimbursed employee expenses such as uniforms, union dues, entertainment and travel. Business-related meals are still deductible, but only 50 percent deductible rather 100 percent. The business standard mileage rate has also been changed, making it so that employees cannot claim an itemized deduction for unreimbursed travel expenses. Moving expenses are also no longer tax deductible, except for members of the Armed Forces and have been given orders to move. The deductibility of state and local income tax payments for federal income tax purposes has been limited to $10,000 per year. Those who have made payments to, or transfers property to, a charity or other organization eligible for tax-deductible contributions, must now reduce their charitable deduction by the amount of any state or local tax credit they receive. The TCJA eliminated personal exemptions, meaning that the $4,050 per person that could be claimed for individuals, their spouses and children last year has been eliminated starting Dec. 31, 2017, and going until at least Jan. 1, 2026, according to the Internal Revenue Service. To help make up for it, the child tax credit is doubling from $1,000 to $2,000, and a new tax credit for other dependents, such as parents or any other nonchildren being claimed as a dependent, has been implemented for up to $500. There are also new changes to the child tax credit phase out. Prior to the TCJA, those who filed as married filing jointly with an income of $115,000 or more would begin losing the child tax credit. The threshold has been increased to $400,000 so more families will receive the credit, Lamber said. The kiddie tax has also been changed so that children with unearned incomes of at least $2,100 will no longer file based on their parents individual tax brackets but will be subject to filing under the trusts and estates brackets, which is significantly higher than individual brackets. The Obamacare penalty for not having insurance has been removed for the 2019 year, but will remain for this season. So, those who did not have insurance during 2018 will still be charged a penalty, but those who do not have insurance in 2019 will not have to pay the penalty in 2020. Prior to this year, the laws regarding state sales tax were set so that online retailers were not required to pay sales taxes in states where they did not have a brick and mortar building. That gave local businesses who had to charge every customer sales tax a disadvantage since some people preferred to purchase goods online where they didn’t have to pay tax. Now Utah, along with 35 other states, have made laws so that businesses selling products online have to pay sales tax in the states to which their product is shipped if they meet certain criteria. Each state’s laws will be different, so businesses are now responsible for tracking the number of transactions and the income they receive from each state, charging customers the appropriate sales tax and filing in that state. In Utah, any business who makes at least $100,000 from goods sold in the state, or makes at least 200 transactions, will have to pay the state sales tax. Those who make fewer sales will not be subject. The new laws mostly affect business owners who now have to keep detailed records of transactions made, business income from each state and of the different laws for each one. The number of states that have such laws is also increasing. “It’s going to be changing probably every week or every month. I think eventually all the states will be listed,” Tuttle said. The qualified business income deduction, otherwise known as the 20 percent pass-through deduction, now allows the owners of passthrough businesses with U.S. based income to deduct up to 20 percent of their business income when filing for their personal tax return, Jacob Sullivan said. “This by itself is probably going to be the best change for business owners that’s happened in a long time,” he said. Most owners of sole proprietorships, partnerships, trusts and S corporations are qualified for the deduction. Those who qualify are generally business owners whose 2018 taxable incomes fall below $315,000 for joint returns and $157,500 for others. The deduction will be for up to 20 percent of their qualified business income plus 20 percent of their qualified real estate investment trust dividends and qualified publicly traded partnership income. Or for 20 percent of taxable income minus their net capital gains, according to the IRS. The deduction is taken out of the business owner’s personal return, but is still specifically related to the income from their business. A complete list of tax reform changes can be found at irs.gov/tax-reform. America is being made great again, thank you Trump! Meanwhile, federal employees just went without their first paychecks because Captain Stupid is holding them hostage. I, like many others, fail to see how that’s making anything great at all. What it’s actually doing is making America WORSE. It’s ok ice puck, there is plenty of help for them. The thing is this: they will get paid. Some of my credit cards have a “are you affected by the government shutdown, we can help…” disclaimer. The difference between government employees not getting a paycheck and you and I losing our job is, they will be paid. The money is good it’s just gonna be late. So company’s will work with them and food banks will feed them. And Trump will get the wall. Empty rhetoric. You make it seem as if 800,000 people have some magic wand they can wave and all will be better. You can stop that crap right now because you’re only fooling yourself. In the meantime, people living paycheck to paycheck are screwed. You can also stop trying to justify your position when this shutdown is hurting Americans. ACTUAL Americans. That should be your concern and clearly, it isn’t. Obama is no longer president. Stop your whataboutisms and live in the now. It’s very true, LBA. Essentially what these gov’t employees are getting is a very long fully paid vacation. The ones who were bright enough to save a month’s worth of pay(which, by right, should be all of them) get to kick their feet up and be paid for doing nothing. The ones who weren’t bright enough to not blow their money like monopoly money might have to get off the couch, pick up the phone, and call their parents to borrow some money. Either that or put some bills on credit cards–really, not a big deal (remember these folks will be paid in full!). So we get these crybaby fed. employees with sob stories about how they’re on the verge of starvation and how the repo man is right outside, ready to take back that new BMW. You cannot image all the tears I’m crying for these poor starving gov’t employees. The ones that the media doesn’t talk about are those that ARE ABSOLUTELY LOVING their very long taxpayer-funded vacays. WHOO HOO! Meanwhile there are tens of 1000s of homeless people all over the country sleeping in tents, sleeping on the sidewalks, sleeping in homeless shelters. Tell me again how many tears I should cry for gov’t employees that are too careless/stupid to save 1 month’s worth of pay??? What part of living from paycheck to paycheck do you not understand? Plant, it looks like you are ignorant when it comes to how the 3 branches of government interact with one another. The legislative branch (Congress and Senate) is 1/3 of the government. The republicans hold the majority in the senate which is actually the powerful side of congress. The democrats are responsible for this shut down by not putting forth anything to end it. The reason for this shutdown is the democrats in congress think that they are more powerful than the president. They are not. They are a bunch of self important crybabies who think they can over ride the president when all they are actually doing is making their party look like they were all homeschooled by elmo. That’s the best you can come up with, really? Plant, you’ve been listening to NPR again, haven’t you. Maybe NPR should put on a few of those fed employees that are absolutely loving their extended vacations. NPR should also discuss why gov’t is hiring people that are not capable of saving up a little emergency fund. Fed Gov’t jobs may not be “glamorous”, but the benefits are excellent and the pay is solid, and job security is simply unmatched anywhere else. There is no excuse for their idiocy. Well by all means come out from behind your keyboard and get involved in the local politics and do something for your community instead of posting your useless rants and name calling you do….